In the following guide, we aim to answer that question by offering an in-depth review of the best RV surge protectors currently on the market and a detailed analysis of what goes into the making of the ideal RV surge protectors for every type of RV. Let’s start off with our top picks of the best rv surge protectors per category for 2019. Why Do You Need A Surge Protector For Your RV? Electrical Management System (EMS) Vs. Standard Surge Protector: What’s The Difference? Which Progressive Industries Surge Protector Is Right For You? If you’re looking to provide maximum electrical protection with a portable RV surge protector, then look no further than the EMS-PT30X (or PT50X if your camper requires 50 amps). It will be hard to beat the full EMS protection it provides against multiple power supply issues with the service and reliability behind any Progressive Industries product. This is a very close second as the Surge Guard 34830, by Technology Research, offers many of the same full protection capabilities as our winner, albeit in a lighter package with better LCD display and higher maximum Joule (2,450) capacity. It does only have a 1-year warranty, however, and we wish it contained weather housing over the plug component. Indication only – no protection from reverse polarity, open ground systems, faulty wiring, etc. For those looking at basic surge protection, with minimal investment, this may be a great option. The ergonomic handles are an awesome and unique feature that make plugging and unplugging this surge protector incredibly easy. We feel confident that you won’t be disappointed with, this, or any of the Progressive Industries hardwired RV surge protectors (LCHW30 if you don’t need the remote display). While they do require a little extra work for their initial installation, they deliver maximum convenience thereafter. We, also, love the out-of-sight, out-of-mind nature of these surge protectors. For the same reason that surge protectors are commonly used around the house, these devices protect your RV’s electrical components from unexpected changes in current (lightning strikes, surges, faulty wiring, etc.). In fact, power fluctuations are fairly common within campgrounds, who seldom have the budget for advanced electrical solutions, yet routinely experience over 100 campers connected to their ‘grid’, each utilizing a different degree of power. In an outdoor setting, these connections are, also, more exposed to the harmful power surges delivered by a lightning strike. The risk of low voltage is highest at older campgrounds who have not updated their electrical wiring, particularly during summer months (increased air conditioning use). A sudden increase (surge) in the power supplied to your RV (most commonly by a lightning strike) can result in smoking, burnt wires, and severely damaged electronics throughout your camper. Reversed polarity at an electrical outlet, where the live and neutral wires have been incorrectly switched, can result in dangerous scenarios where electronics are still ‘live’ even when turned off. Outlets that have been installed without a ground connection, or those that contain an existing defect to a current ground wire, will be most susceptible to unprotected power surges. Many surge protectors, actually, rely on a grounded outlet to redistribute power fluctuations correctly. There are two main styles of surge protectors available to RV users. Convenience, security, and ease of installation are the key factors that will help determine which is right for you. Portable surge protectors are smaller, lighter, and designed to be plugged directly into the shore power electrical box at a campsite. There is no formal installation required with a portable surge protector, and they are often marketed as plug-and-play capable. They do require retrieval and storage upon arriving/leaving every new site. Since they are used on the exterior of the RV, theft is a greater concern with portable units. Consider an additional investment in lockable housing for your portable surge protector to reduce this risk. 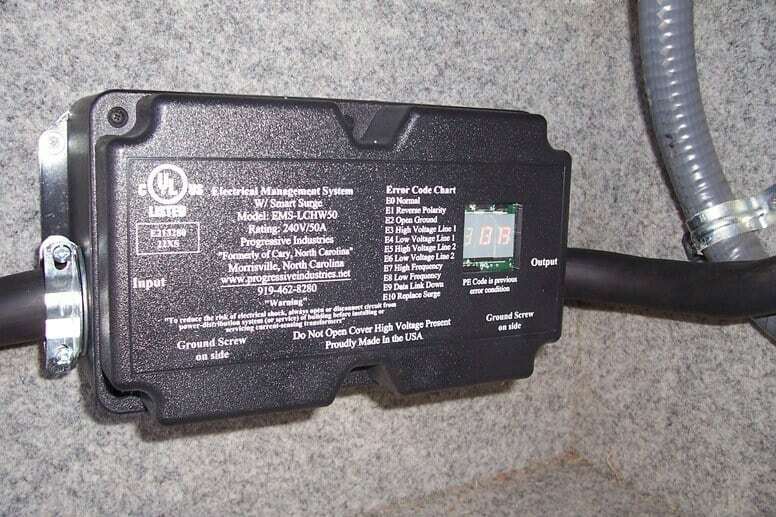 Hardwired surge protectors are installed on the interior of an RV, typically, within its power or electrical panel. These medium-sized black boxes require greater effort and precision with initial installation (may need to consult a professional if you don’t feel confident with DIY installation), however, they require minimal maintenance thereafter. With hardwired protection, there is no need to carry a portable unit to and from the electrical box. Simply plug your RV into shore power and you are always protected. 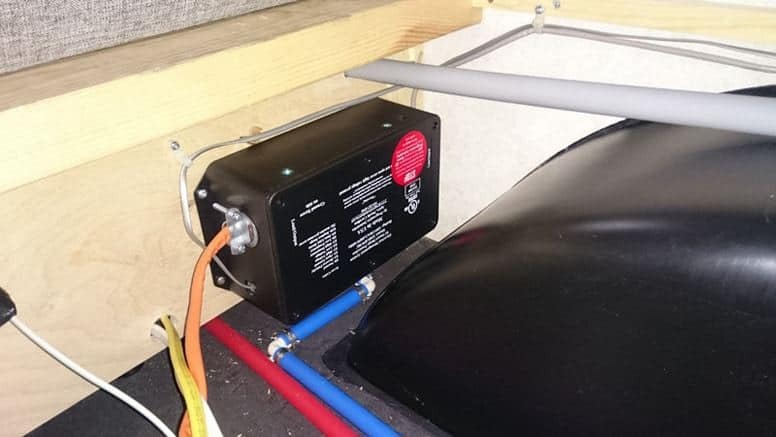 Since the unit is located within the interior of the camper, hardwired units are, also, better protected from weather and potential theft. Those new to shopping for RV surge protector systems are, often, confused by this difference in classification seen among many leading products. It’s really just a difference in the degree of protection you desire and your budget. One of the key distinguishers between an EMS surge protector and a standard surge protector will be a unit’s ability to detect a problem or to detect AND protect from that same problem. Both will protect your RV from a sudden spike in voltage, like with a lightning strike, which is why the term ‘surge protector’ is commonly used to describe either version. Only an EMS system, however, will protect from other common issues, such as reverse polarity, open ground connections, or moderately low/high voltages. It’s no secret that prudent RV owners should maintain proper insurance coverage for their campers. Unfortunately, many are unaware that most policies exclude coverage for power surge events causing damage to electrical systems. Every policy is different, and while we encourage you to read the fine print when purchasing your RV insurance, it’s unlikely that it will cover electrical damage caused by a faulty power pedestal supply or surge at a campground. Consider an investment in an RV surge protector as your insurance policy against expensive, electrical damage. While we haven’t found an insurance provider willing to provide discounts for having one (since they don’t cover the resulting damage anyway), consistently using a surge protector is, actually, a rather affordable form of insurance. If electrical work was always done right the first time, then this is a problem we’d never need protection from. Unfortunately, that’s not always the case and it’s more likely to happen in campgrounds where ‘friends’ or hosts may be serving as electricians. If an outlets’ neutral and live wires are, mistakenly, connected to opposite terminals, it can result in electronic damage or devices that contain current even when turned off. Reverse polarity detection, and protection depending on the model, alerts you to this situation. Surge protectors rely on grounding at outlets to disperse excess voltage, preventing it from entering the electronics within your RV. If a grounding wire has not been properly connected, or an existing one has been damaged (animal chewed through wire, decay, etc. ), your surge protector may not function properly. Identify an open ground error before it costs you big time and money. Most power within the United States is supplied at 120 volts. There are exceptions, however, with many household electronics needing 240-volt power supply (clothes dryers, ovens, stoves, or even electric cars in your garage). If your mobile home, travel trailer, or class B van (all 120V) is plugged into a 240V outlet without protection, it is likely that you will damage thousands of dollars of electronics. Some surge protectors (EMS versions) will monitor the alternating current frequency and automatically shut off if it deviates too far from the standard (60hz). Many surge protectors will include easy to read displays which help you discern a given error code or in some cases provide you with current usage statistics. Units with this feature will idle for a set period of time (136 seconds with Progressive’s) before supplying power to the RV. This can ensure that proper power supply is achieved before sending it through, as well as allow the compressor within AC units to decompress properly after a shut-off has occurred, before immediately restoring power. Error codes on most surge protectors are obvious when a fault is active, but what about after one has occured, and power subsequently restored (perhaps while you were away)? This feature allows you to view past error codes so that you may understand why the power supply was affected, even if it has since returned to normal operating status, with no error code present. Three or five-mode protection ensures that the device is capable of handling maximum surges at fast response times. Over the last twenty years, Progressive Industries has developed into the leading provider of electrical protection products for RV consumers. That is in large part due to their dedicated focus upon this niche industry. In fact, progressive’s product lineup consists of, only, RV surge protectors and electrical adapters, allowing them to perfect each product. They are intimately familiar with an RV owner’s needs and develop products to suit. Products all produced in the U.S.
*Please note that the only difference between the above devices is the amperage output. Make sure to purchase the appropriate protector/plug for your camper’s power supply requirements (30A or 50A). If you’d like the full range of monitoring and protection offered by the electrical management systems above but would prefer the added security and convenience of an ‘out-of-sight’ installation check out one of the hardwired Progressive Industries products below. The key difference between these models is the location of the display screen. With the LCH’s the display screen is built into the device, simple design if the placement of your unit will be in an easily readable location. If not, the HW’s may be a better fit as they include a remote LCD display which can be placed in a better viewing location away from the box itself. Once again, models are offered in both 30A and 50A compatibility. Honestly, you don’t need top of the line protection with every RV accessory, and the concept of shelling out $200+ on a surge protector may be tough to justify. 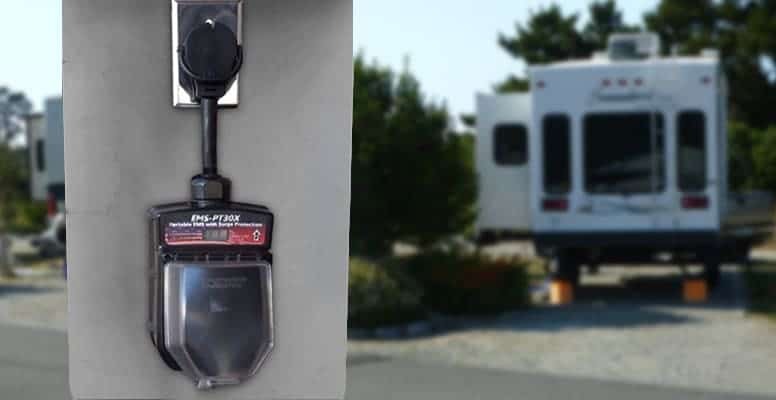 If you’re just looking to protect your camper from basic power surges, while maintaining the ability to identify faulty power pedestals before you connect, check out these more affordable options from Progressive. They are, still, high-quality products that add considerable electrical protection to your RV the moment they are connected. As with any RV accessory purchase, there are a few basic factors that will help determine which product is right for you. Here are a few considerations, based on our experience, that are pertinent to selecting an RV power surge protector. 30 Amp or 50 Amp RV? Amperes (amps) are a measure of electrical current, and every RV is designed to work with one of two major supply classifications: 30A or 50A. This will, largely, be determined by the size and electrical requirements (refrigerators, stove, microwave, oven, ac units, TVs, etc.) of your RV. When purchasing a surge protector, be sure to match it with your RV’s power supply. You’ll notice that each product we reviewed contained two ‘versions’, one for 50A (4 prongs) users and one for 30A users (3 prongs). What class and size is your RV? If you drive a class A or C motorhome, or a travel trailer or 5th wheel, then you will likely benefit from the advanced protection found within an EMS system. These larger RV’s, typically, contain multiple high-end electronics, meaning a single faulty power event has the potential to destroy thousands of dollars of hard to replace equipment. This will, also, make justifying the higher investment required of an EMS surge protector a bit easier. Alternatively, if you are looking to power a conversion van, or perhaps a smaller pop-up trailer that doesn’t contain refrigerators, ac units, microwaves, or TVs, it may be silly to spend the money on a full EMS system when there isn’t much at risk in the first place. A simple, portable RV surge protector will, still, protect the few electronics you do have, albeit at a much more reasonable cost. Where Do You Camp Most? The quality of electrical power supplied at campgrounds varies considerably. Modern campgrounds utilizing professional electricians for power setup will pose, significantly, fewer risks than those who haven’t seen an update to their archaic electrical systems in decades. If you travel frequently, camping at a wide array of campgrounds throughout the country, you will likely benefit from more advanced RV surge protectors, since you are more likely to experience a problem. If you spend most of your time camping at, only, a few locations that you trust, then your need for heavy-duty EMS surge protection may be reduced. 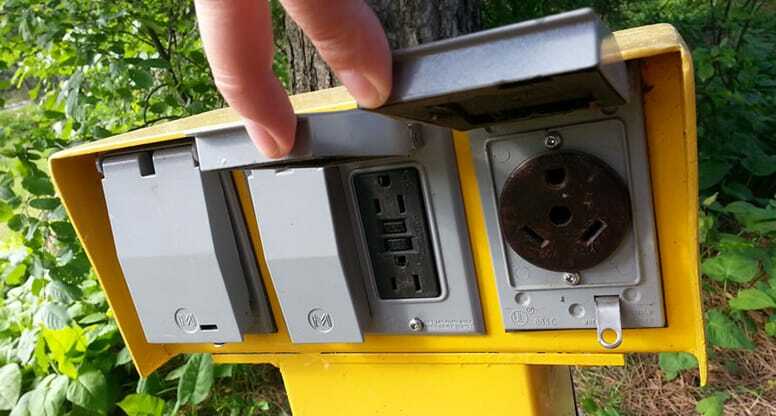 Remember, just because the electrical box and/or pedestal at a campsite looks well cared for doesn’t mean the power has been wired correctly. As we mentioned above in our section comparing portable RV surge protectors with hardwired (permanent) versions, there are advantages/disadvantages to either. 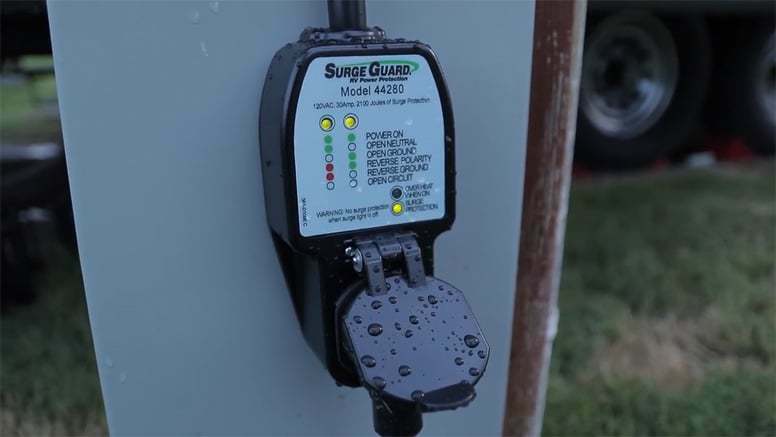 Determining your level of concern with theft and your desired convenience for installation will, likely, make your RV surge protector decision easier. Ultimately, the degree of RV surge protection you select is less important than the protection itself. Something is definitely better than nothing when it comes to protecting your RV’s costly electronics. Don’t make the mistake of many RV owners who purchase a surge protector, only after they have experienced a problem. If you’ve got a story of a time when you identified bad power supply at a campground or a time that your electronics were saved by an RV surge protector, please let us know in the comments below.